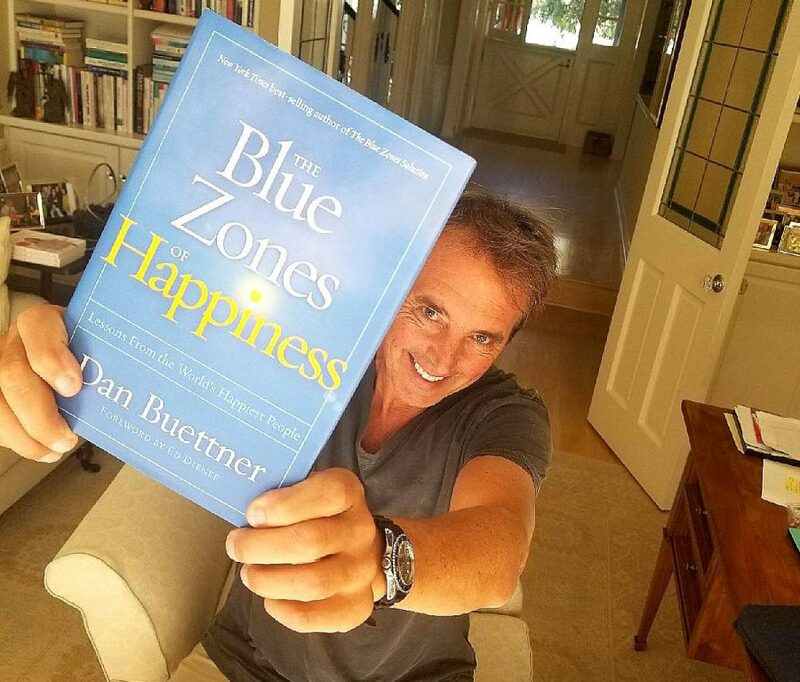 Blue Zones founder Dan Buettner spent the last two years working on The Blue Zones of Happiness. He took a tack similar to previous blue zones longevity research: first, he identified the statistically happiest populations, and then, through regression analysis and shoe-leather journalism, he distilled the lessons they have to offer the rest of us. 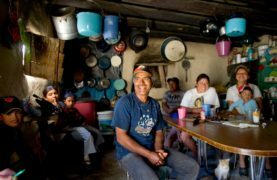 Buettner traveled to happiness “hotspots” in South America, Asia, Europe, and the United States and profiled the happiness paragons of Denmark, Singapore, Costa Rica, and Boulder, Colorado. In the book, he describes three measurable facets of happiness (Life Satisfaction, Positive Affect, and Purpose) and how these places have achieved greater well being for their populations. The story and research also graces the cover of the November 2017 issue of National Geographic. We sat down recently to chat about the book, happiness research, and what people can do to increase their happiness. 1: How did you determine the happiest places in the world? Isn’t there some fluctuation depending on which list you use? Dan Buettner: I started with only the facets of happiness you can measure. The first kind of happiness points to life satisfaction and is determined by asking people to rate their lives on a scale of 1 to 10. The second kind of happiness is purpose, and it’s measured by people rating how engaged they are with their lives, and if they’re doing meaningful things every day. 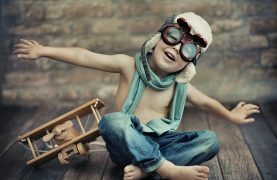 The third measurement of happiness is how much people enjoy their lives on a day -to-day or moment-to-moment basis. That’s determined by asking people to remember their last 24 hours and report how many times they felt joy, laughed, or smiled. 2. You traveled to global happiness hotspots in your research for this book. Where did you go? DB: I visited many areas, but spent the most time in Singapore, Costa Rica, and Denmark, which are destinations that consistently top the lists of world’s happiest places. 3. What surprised you the most in your research for this book? DB: I was most surprised in my research to discover that there are three different kinds of happiness. And I traveled to places that epitomized each. 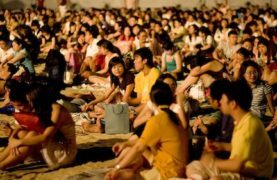 Singapore is the happiest country in Asia, and it epitomizes the kind of happiness that comes from life satisfaction. People there like a clear and easy path to success, and they don’t mind working hard. They prefer security over freedom, and they want to live out largely conservative values. People experience life the best in Costa Rica. It’s green, there’s easy access to nature, and there’s a feeling of equality as everybody has their basic needs covered. They prioritize social interaction, and they will almost never work extra hours if it means they have to forego a good party. 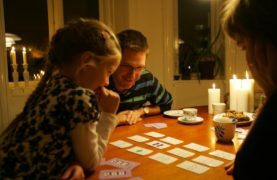 They also prioritize family — Sunday afternoons are spent with family and big long lunches. They are also religious, and research shows that religious/spiritual people are happier. In Denmark, people live with more purpose than anywhere else. All their health care, social security, and education is covered. They have almost all their daily needs taken care of, so they don’t need to “keep up with the Joneses.” This pushes people into careers they love. The Danes work 37 hours a week, belong to clubs, and are able to pursue their passions and use their strengths. An interesting side note to relate our findings to today’s headlines: In places where there is gender equality, men and women are all happier across the board. So it’s in the best interest of men (and society) to treat women fairly in all aspects. 4. You also researched some happiness hot spots in America, even though on the whole, America generally is not at the top of happiness charts. What were these cities and towns doing differently? Bikeable, walkable cities are almost always happier. Access to parks and green spaces makes for happier residents. Reducing fast food and junk food consumption and making fruits and vegetables cheaper and more accessible makes for happier, healthier residents. There were also other quirky things like the absence of billboards. Happy cities do away with billboards — the only people who like them are advertisers. Happy cities also take care of needy people: anywhere in the world, happy communities have good health care, good education, and quality social services. As part of this project, I also recruited 15 of the world’s top academics in this field of study and organized a Delphi consensus to identify the most effective and feasible policies to yield life satisfaction in nations. 5. How important is wealth and money to happiness? DB: When you evaluate your life overall, money is important. Millionaires are generally happier than people who make $30,000 a year. But $75,000 is about the cap. If you make more than that, then your day-to-day experience doesn’t get any better — you just have more stuff. This 75k marker is an average and is also on a sliding scale based on where you live (75k in NYC doesn’t mean the same things that it means in a rural community). 6. How important is health to happiness? DB: Health and happiness go hand in hand. You cannot pull the two apart, and one doesn’t exist without the other. If you are among the happiest 20 percent of people, you live around eight years longer than the saddest. So a real strategy for living longer is getting happier. In the original blue zones regions, where people live the longest, healthiest lives, people tended to be happy. Their environment and culture nudged residents into positive behaviors that improved life satisfaction. 7. How much do you think someone’s individual temperament affects their happiness? DB: Genes determine a set range of happiness as opposed to a set point. That means we have a lot of influence over our own happiness. In The Blue Zones of Happiness, I break down evidence-based ways to improve different happiness-boosting areas of life. 8. Who do you think is making a difference in happiness research these days? DB: I coordinated the world’s best happiness and well-being researchers to compile the data and research in the book, and every single one of them is doing incredible work in the field. Among them is Johannes Eichstaedt, one of the brightest stars, who measures the psychological states of large populations using social media. For example, people who use words of high energy are proven to be happier than people who use words like “bummer” or “tired.” Dan Witters at Gallup is doing the best job at measuring happiness and interpreting data in real time. John Helliwell in Canada is doing fascinating well-being work: He showed that when immigrants move to Canada, they receive a significant happiness boost. If you live in an unhappy place and move to a happy place, it can substantially favor your happiness. 9. What’s something that makes you personally happy on the regular? DB: I love exploring traditional peoples of the world and distilling their wisdom. Nothing makes me happier than putting that wisdom to work in American cities. 9.5 What can someone do right now to increase their happiness? DB: Make a new happy friend — that’s one of the best things you can do. Your happiness will go up 15 percent. And volunteer, even if you think you don’t have the time. People who find meaningful ways to give back are happier. Also, do your best to always sleep 7.5 hours a night. People who sleep 6 hours a night are 30 percent less happy than people who sleep more. Learn more secrets of the world’s happiest people and places in The Blue Zones of Happiness. What do the Happiest People in the World Have in Common?